This is perhaps the most important aspect of the Reds team heading into 2008. The bullpen has almost single-handedly unraveled the last two seasons for the Reds. Not to mention, it seems like whenever the Reds are good, it's due in large part to a very strong bullpen. Whether it was the Nasty Boys in 1990 or the more recent vintages featuring Scott Williamson, Danny Graves, Stan Belinda, and the absurdly underrated Scott Sullivan. Krivsky made a big splash this offseason by signing Francisco "Coco" Cordero to a very large multiyear contract. Given how few innings relievers work, it is a questionable way to spend such a large portion of your payroll. However, given how ineffective the bullpen has been and how that has demoralized the team, the move is understandable, even if not entirely defensible. Now that the makeup of the bullpen has finally been settled, we can take a look at what to expect in 2008. 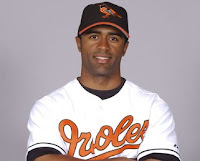 Francisco "Coco" Cordero was easily the best closer available on the market and Krivsky wasted no time in locking him up, as he moved quickly and decisively to address the problem. In addition, the Reds weakened the Brewers by signing away their closer. Cordero was truly dominant last year, but time will tell if he can be that dominant again in 2008. It is clear that 2007 was the best year of Cordero's career, so it'll be interesting if he can continue to perform at that level. A complete dropoff seems unlikely, as Cordero has had good season before, so he should at least be solid. Coco is strictly a two pitch pitcher. He throws a high velocity fastball and a nasty slider. Last year, his fastball averaged out at 96.1 MPH and his slider averaged 88.8 MPH. Coco threw the fastball 50.4% of the time and the slider 49.6% of the time. Cordero's high strikeout/low contact rate style is the ideal fit for the Reds, who play in a homer friendly park with a porous defense. If Cordero can dominate the 9th, then Weathers and Burton will be left to handle the 8th and 7th innings respectively. The Cordero signing bumps everyone else down a role, so it could have a significant trickle down effect on the 2008 bullpen. Overall, the Coco signing addressed a huge need and may go a long way towards addressing the team's biggest weakness of the past few years. David Weathers continues to defy the odds and I'm hoping he can do it again in 2008. You'd think that at SOME point, he'll lose effectiveness. At SOME point, he'll become a liability, rather than an asset. However, despite all predictions and prognostications to contrary, Weathers just keeps going and going and going. I don't foresee Weathers losing any effectiveness because he's moved up from the 9th inning to the 8th inning, but maybe this is the year his age catches up with him. Then again, maybe not. I don't know how Weathers continues to be so effective, but he certainly does. For the Reds sake, 2008 had better not be the year that he loses it. It really is a tale of two halves with Burton. In the first half, he struggled just like you'd expect from a Rule V draftee. However, in the second half, Burton really exploded onto the scene. In the first half, Burton pitched only 8.2 innings and posting a 5.19 ERA with a 9/7 K/BB ratio. The Reds took advantage of every opportunity to put him on the DL and get in some "rehab" work in the minors. When Burton got back after the All Star break, he was a different pitcher. He posted a 1.83 ERA in 34.1 innings with a 27/15 K/BB ratio. 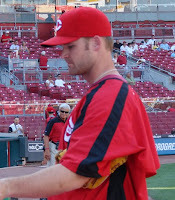 He was dominating and really helped solidify the Reds bullpen. On an even more positive note, some of the guys doing analysis of pitch data think Burton's fastball has such good velocity and movement that it's most accurate comparable is Mariano Rivera's cut fastball. Whether or not that's accurate, the fact that it is even being mentioned in the same sentence is a positive. It'll be interesting to see which Burton we get in 2008. It's hard to imagine him being as successful as he was in 2007, so a small step backward is probable. However, if his control improves a tick, then he could be just that could, which would go a long way towards solidifying the Reds bullpen. There may not be a more improvement pitcher in the Reds bullpen this year. Jeremy Affeldt is an interesting pitcher. I've had my eye on him for quite sometime, because he has a tremendous arm. He could be a power lefty, which is a rare commodity in the game today. He's a got a very good fastball and a nasty, sharp breaking curveball. In addition, he gets a high percentage of groundballs. He's got everything he needs to be successful, but he just doesn't ever command it well enough to be actually be successful. Obviously, the Bill James projection is based on Affeldt being a starter, so maybe he would fare better if he were programmed to be a reliever. Regardless, the Reds need Affeldt to be successful in 2008 for his production, but also because a good season would likely increase his Elias ranking and net the Reds a compensatory draft pick after the season. As it stands, Affeldt always seems like a pot about to boil over. He managed to keep a lid on it last year long enough to have decent success, but there's no guarantee that he won't just boil over in 2008. In fact, pitching in front of the Reds defense may be just detrimental enough to ensure that Affeldt cannot be successful in 2008, as his margin for error is non-existent. Affeldt could be a bust in Cincy or he could finally put it altogether and become a dominant force in 2008. If I had to bet, I'd lay money on the former over the latter, but crazier things have happened. Todd Coffey is baffling. He really is. He's one of those guys who SHOULD be better than he is. One of those guys who has a good strikeout rate, good walk rate, and good GB/FB ratio. He's got all the harbingers of success, but never gets the success itself. There are a select few others in this category, including Dave Bush, Jeremy Bonderman, and arguably Matt Belise. However, none of them ever quite live up to what we think they should. This offseason, Coffey lost a significant amount of weight. Last year, he was pitching at 264 lbs, but at last weigh-in was at 248 and shooting for 240. When year in and year out you struggle, ANY change is cause of optimism. You don't want every thing to keep staying the same, as they likely wouldn't lead to new results. 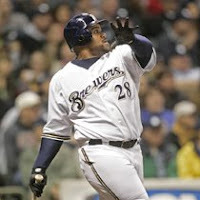 However, Coffey's weight loss gives us a reason to hope that 2008 will be the year that he finally puts it altogether. The year his heavy fastball and even heavier GB/FB tendencies pays off huge for the Reds. The Reds desperately need someone to step up and be the 4th quality reliever in the bullpen. 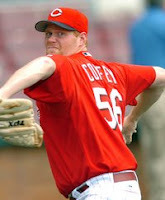 It would be great if it were Todd Coffey, as he should be exactly the type of pitcher the Reds need. Whether it'll happen remains to be seen, but maybe a more fit Coffey is a more effective Coffey. Mercker was out of baseball in 2007 due to a brain aneurysm and his recovery is just a great story. However, this leaves us with no projections for him, but perhaps the most important number on Mercker is 40, which is his age. At this point, I guess we have to consider Mercker to be a lefty specialist, though his performance against lefties over his career isn't all that much different than against righties (OPS vs. L: .712, OPS vs. R: .770). It's interesting that the Reds chose to keep Mercker over Mike Stanton. If the Reds looked at Stanton this spring training and saw no sign of him turning things around, then I applaud the decision to eat his salary. It's not beyond the realm of possibilities that it was his IPED use that made him effective in the recent past and it certainly didn't help his image in Cincy, so maybe we should be thanking George Mitchell. However, it seems odd that the Reds would decide to cut him loose and then replace him with a lefty who is no better bet for success. Am I mistaken, or is Mercker a very comparable player to Stanton? Both left-handed relievers who are at the very tail end of their careers. Each a bit of a long shot bet for success in 2008. So, if you have the same player, but one makes $3M and the other the veteran minimum, then wouldn't you want to roll the dice that the $3M man will bounce back enough to enable you to not have to eat the entire contract? I'm glad Stanton is gone, but I just wonder about dumping him without having an appreciable upgrade ready to take his spot. This one is a true head scratcher. Mike Lincoln has never been a consistently effective reliever, so I'm really not sure what he's doing in our bullpen. I'm not going to spend much time on Mr. Lincoln, because I don't think he's going to be around very long. He seems like a likely bet to be replaced by Josh Roenicke, Pedro Viola, or Matt Belisle in the near future. 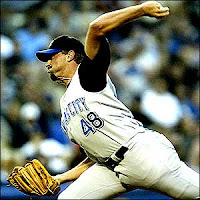 Lincoln had Tommy John surgery in July of 2004 and an additional surgery for an elbow debridement in 2005. So, on the positive side, maybe he's just now recovered enough to be a positive member of the bullpen. However, his career 5.4 K/9 and 3.3 BB/9 don't exactly instill a lot of hope. The most pertinent fact about Lincoln's presence in the bullpen may well be that it is a sign that our bullpen isn't as good as we hoped it might be. In fact, at this point, I have to question how improved it really is over the 2007 version. This is our new and improved bullpen? Is it even any better? I suppose we could conceivably have 3 quality relievers instead of just 2, but it's still very clear that this bunch will walk too many and struggle too much to be a top bullpen. We've got some live arms in the bullpen (i.e. Affeldt, Coffey), but I'm just not sure the pitchers to whom they are attached have any idea what to do with them. Maybe Burton will continue to dominate like he did in the 2nd half, Coffey will take a step forward, Affeldt will continue to successful walk his fine line between effectiveness and train wreck, and Mercker will find the fountain of youth. But, in the end, there just seems like too much risk and too many "ifs" at work here. As it is currently configured, I'm really not sure this bullpen is playoff caliber, so hopefully Josh Roenicke and Pedro Viola can come up and make it 5 deep, instead of just 3. If not, this could be another long year in the Cincy pen. Well, the picture is becoming much clearer. It seems fairly obvious that the Reds rotation is set and somewhat surprisingly it won't include Homer Bailey, but will include Johnny Cueto. The rotation has a stud #1 starter, a solid veteran, two rookies with lightening in their arms, and one veteran filler. It's an interesting combination, but there are still 3 question marks. It'll be interesting to see how it all plays out, but it's impossible to know what we can reasonably expect out of Cueto and Volquez and it's impossible to like what we can reasonably expect from Josh Fogg. What more can really be said about Harang? He's a stud, plain and simple. He combines a high level of performance with a heavy workload, so the sheer volume of quality innings he provides is of inestimable value for the Reds. The Reds weak rotation and poor bullpen of years past would each be exponentially worse without Harang. It's remarkable to think that the Reds got him from the A's in the deal for Jose Guillen. Harang is the most important player to the present and future of the organization. If you really want to give yourself nightmares, imagine where the Reds would be if Harang were to get injured (knock on wood). There is a lot of optimism over the Reds, but one injury to Harang and they are back in the dark ages. He's that important. Given how consistent he is, it's no surprise that both Bill James and ZIPS expect more of the same from Harang, which is music to the ears of Reds fans. 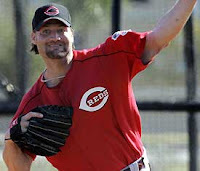 Arroyo is a key pitcher in the Reds rotation. Ideally, in 2008 he'll prove that he is closer to the 2006 version than the 2007 version. If the Reds are going to make a serious push this year, then they need Arroyo to be good. The Reds already have 3 question marks in the rotation, so both Harang and Arroyo need to deliver. If Arroyo can pitch at his 2006 level, then Harang and Arroyo combined will provide 400+ innings of top notch pitching production. Unfortunately, I don't have faith in Arroyo like I do with Harang. That said, I'd be happy if he could match the Bill James projection. By this time next year, Arroyo will likely be pushed back to the #3 or even #4 spot in the rotation. I'm hoping for a nice bounce back season, but expecting Arroyo to be our 3rd best starter behind Harang and Cueto. Cueto was truly astonishing in 2007. He was dominant at 3 separate levels of the minor leagues. The competition level kept increasing, but it didn't matter as Johnny just kept mowing them down. Spring training this year was just more of the same, second verse, same as the first. Johnny just continued to get it done. The very fact that he is going to open the year in the rotation speaks volumes. The Reds have an organizational culture that is unaccustomed to good young pitching, so Cueto had to be very good in Spring Training to overcome the team's hard earned mistrust of young pitchers. Cueto has great stuff and good control, but his ability to carry over his success against MLB hitters will be determined by his command. His ability to hit his spots inside the strikezone has been called into question at times and MLB hitters don't often miss location mistakes. Overall, the future is supernova bright for Cueto and may mark the end of the Dark Ages of player development in Cincinnati. Volquez has certainly gotten off on the right foot in the Reds organization. His spring training has been almost as impressive as Cueto's and his strong K/BB ratio shows a nice blend of power and control. However, I still have questions as to whether he's succeeding on the back of the fastball/change-up combination. If he is, that may not be sustainable the second and third time around the league. To be successful in the rotation, Edinson needs to have an effective breaking ball. He has to have a pitch that can change the eye level of hitters. He needs an offering that works in two planes. MLB hitters are simply too talented to be fooled by straight pitches time and again. If all they have to worry about is the speed of the pitch and not the break, then it's only a matter of time before they get the timing down. 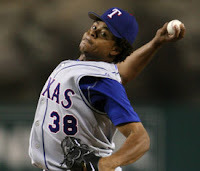 Volquez has an electric fastball and an impressive changeup, but his success will still be driven by his breaking ball. If he can command his curveball, then he could be a very effective starting pitcher. If not, then he's likely headed for a career in the bullpen. It'll be interesting to see if Edinson can carry his Spring Training success into the regular season. Josh Fogg is Josh Fogg. His strikeout rate is too low, his walk rate is too high, and he won't get the benefit of the elite Colorado Rockie defense. I hope I'm wrong, but this has the look of a "Miltonian" disaster. Too many baserunners via the walk, too much contact from the low strikeout rates, and too little range from the defense. It all adds up to a lot of baserunners allowed and a lot of runs allowed. Unfortunately, it's hard to imagine the Reds having more than 3 quality starting pitchers in 2008. Cueto and Edinson will have their ups and downs, Fogg should be well below average, Arroyo will probably be a solid #3 starter, and Harang should be in the running for the Cy Young yet again. Will that be enough for the Reds to make a big playoff push in 2008? I have my doubts, but time will tell. As per usual, the Reds will have a crowded outfield in 2008. It's been the case for years and will continue to be the case next year. After next season, it is entirely possible that both Adam Dunn and Ken Griffey Jr. will be gone. Until that time, it's still a bit of a logjam, but it appears that the centerfield race is coming to an end, so it's time to take a look at what we have for 2008. .264/.386/.554/.940 in 522 ABs with 40 HRs, 107 Runs, and 103 RBIs. .251/.386/.537/.923 in 566 ABs with 43 HRs, 107 Runs, and 103 RBIs. .239/.366/.498/.864 in 524 ABs with 36 HRs, 94 Runs, and 103 RBIs. Dunn continues to be a lightening rod for discussion. I'm not sure there is a more polarizing figure in the majors today. The crown formerly belonged to Barry Bonds, but his forced exile has made Dunn the likely successor. I suppose the reason for it is that Dunn, more than any contemporary player, straddles the divide between traditional scouting and statistical analysis. To watch him play is to see an awkward fielder with a poor arm and an inability to make consistent contact. To look at his stats is to see a massively productive player who combines power and patience like few other players. So, in essence, your view on Dunn depends on your larger view of baseball. One thing I've been watching is the possibility of an early decline from Dunn due to a reliance on "old player skills." Bill James first suggested the idea that young players whose value is driven by power and patience will likely decline earlier, as they are less equipped to deal with a slowing bat or the loss of a step. A player with a myriad of skills or with a surfeit of speed can better deal with aging. In short, Rickey Henderson can afford to lose a step, but Adam Dunn cannot. Ichiro can afford a slightly slower bat, but Adam Dunn cannot. Dunn has yet to demonstrate any sort of decline, but if he does slip a notch then he could decline in a hurry. While he has been and continues to be very productive, I wouldn't be in favor of giving him a long term deal, as he seems the type whose production could fall off the table in a hurry. For 2008, it seems like more of the same, though the Bill James projection is much more optimistic than ZIPS. The Reds will have a difficult decision to make after the season on Dunn and his production next season will go a long way towards helping them decide. .269/.304/.386/.690 in 461 ABs with 8 HRs, 65 Runs, and 45 RBIs. .267/.309/.424/.733 in 439 ABs with 13 HRs, 63 Runs, and 47 RBIs. .257/.295/.402/.697 in 495 ABs with 14 HRs, 70 Runs, and 65 RBIs. At this point, it seems like C-Pat is a "stone cold, lead pipe" lock to be the opening day centerfielder. How the hell did that happen? Honestly, I'm not sure, but evidently Dusty works in mysterious ways. Jay Bruce is on the verge of following Chris Dickerson to the minors, while Freel and Hopper have been marginalized as viable everyday players. Given the way events have unfolded, I'd actually be surprised if C-Pat isn't the starting centerfielder. On the positive side, Patterson can run and play solid defense. On the flip side, he probably brings the worst everyday player on base percentage in the majors to the table. He also makes inconsistent contact and doesn't bring much power to the table. All in all, he's a Dusty guy and the best that can be hoped for is that Dusty doesn't use him as the leadoff hitter. Unfortunately, there's really no more appropriate way to kick off the Dusty Baker era than having Corey Patterson get the first AB of the year. .277/.372/.492/.868 in 528 ABs with 30 HRs, 78 Runs, and 93 RBIs. .263/.353/.487/.840 in 495 ABs with 29 HRs, 72 Runs, and 84 RBIs. .272/.346/.480/.826 in 427 ABs with 23 HRs, 62 Runs, and 81 RBIs. There isn't much left to be said on Ken Griffey Jr. He's one of the best players to ever pull on a pair of spikes. Unfortunately, his time in Cincinnati just never worked like it was supposed to work, which is a remarkable statement given how well things started. The Reds made a winning trade to acquire him and signed him to a below market contract rate. Given that, how could it NOT have worked out? It's almost inconceivable, but it's been something just short of a disaster since he arrived. At this point, the fairytale is very unlikely to end happily ever after. Even if Griffey manages to avoid the injury bug that has plagued him, his level of production has fallen off. He can still be a very productive player, but he's not the game changer that he once was. 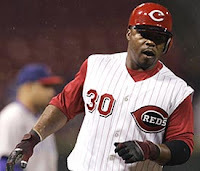 Personally, I think Griffey Jr. has gotten more than his share of unfair criticism during his time in Cincy, but maybe he can lead us to the postseason in 2008 and change the baseball climate in Cincinnati. That wouldn't be such a bad legacy for Jr.
.329/.371/.388/.759 in 307 ABs with 0 HRs, 51 Runs, and 14 RBIs. .309/.353/.350/.703 in 220 ABs with 0 HRs, 29 Runs, and 16 RBIs. .291/.330/.340/.670 in 382 ABs with 1 HRs, 51 Runs, and 30 RBIs. While I'm not as high on Hopper as some, he has begun to grow on me. In fact, I'm intrigued by his ability to get on base while rarely hitting the ball out of the infield. It's a unique skill, but one that might actually be sustainable. At the very least, I would prefer to see him get the opportunity, but guys like Hopper have to fight for every last ounce of respect. One would think that Hopper deserved first crack at the starting centerfield job based on his performance in 2007, but, unfortunately, Dusty didn't see it that way. For some players, shaking the label of "bench player" is one of the most difficult things to do. This may have been Hopper's best chance to lay claim to the title of "everyday player" at the major league level, but it's a chance that seems to have slipped through his fingers. At the very least, he's a backup who can handle all three outfield positions and do an admirable job of setting the table. 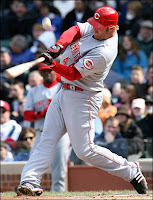 Well, with the MLB season just around the corner and the roster starting to take shape, it's time to take a look at what we can expect out of the Reds in 2008. To aid this little endeavor, I've included the stats for 2007 and two sets of 2008 projections for each player, including a Bill James projection and the well established ZIPS projection. Bill James: .233/.311/.458/.768 in 330 ABs with 19 HRs, 50 RBI, and 38 Runs. ZIPS: .203/.275/.369/.644 in 187 ABs with 8 HRs, 24 RBI, and 18 Runs. After a breakout out 2006 season, the Reds made Ross their full time starter only to see him regress significantly to the mean. While the regression certainly should have been expected, that doesn't necessarily mean that it was. I'd be curious to know what the Reds expected to get out of Ross in 2007. By now, it should be obvious to everyone that 2006 was the exception, not the rule on Ross. 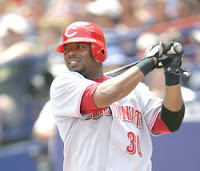 However, Ross could still be an effective player for the Reds in 2008. In fact, the Bill James projection would make him a very effective player in 2008. In 2007, Ross had an abysmally low BABIP of .228, which should only improve in 2008 right along with his batting average. Given that Ross (69%) has a lower career contact rate than Adam Dunn (72%), he's never going to challenge for a batting title. But, he should be a bit better than he was in 2008. 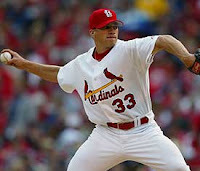 Interestingly enough, Ross actually saw his strikeout rate decrease from 2006 (30.4%) to 2007 (29.6%). Overall, Ross should be a bit better 2008 season, falling somewhere in between his strong 2006 and poor 2007. The power is legitimate and the batting average should rebound to the .225-.230 range. While he'll never be confused with Johnny Bench, if Ross can hit .230, then his power and solid defense should prevent him from being a complete liability behind the dish. .321/.360/.548/.908 in 84 ABs with 4 HRs, 11 Runs, and 17 RBIs. Bill James: .307/.388/.533/.920 in 460 ABs with 24 HRs, 71 Runs, and 81 RBIs. ZIPS: .281/.357/.466/.823 in 556 ABs with 23 HRs, 55 Runs, and 88 RBIs. 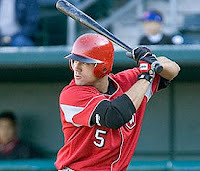 Joey Votto has been one of the Reds top prospects for the past couple of years and finally got his opportunity to play at the end of 2007. In his brief cup of coffee, Votto provided a tantalizing glimpse of the future and justified the faith of the Reds nation. As long as the Reds give him an opportunity to play and don't try to change him too much, then he should be productive. However, if Dusty tries to change his approach at the plate and turn him into more of a Corey Patterson type hitter, then Votto will be a disappointment in 2008. Baker mentioned not liking Votto's approach at the plate, because he didn't like to see called third strikes. Unfortunately for Dusty, Votto struck out 15 times in 2007 and only 1 of those was a called third strike. His approach at the plate is very strong and certainly doesn't need to be altered by Dusty Baker. The Reds need to just "set it and forget it" when it comes to Joey. Plug him into the lineup and let him do his thing. If they do that, then they'll like the results. .288/.331/.485/.816 in 650 ABs with 30 HRs, 107 Runs, and 94 RBI. Bill James: .268/.316/.438/.754 in 630 ABs with 23 HRs, 90 Runs, and 79 RBI. ZIPS: .271/.325/.435/.760 in 568 ABs with 21 HRs, 87 Runs, and 79 RBI. Phillips undeniably had a very strong year in 2007, but often times big steps forward are followed up by small steps backwards. It would seem that projections are adhering to this maxim. At the very least, I would really expect Phillips' on base percentage to fall below .330 in 2008. He doesn't have good on base skills and benefited from 12 HBP in 2007, which pushed his OBP up over .330. Unless Phillips can better his .288 batting average, he seems likely to post a very low on base percentage in 2008. Overall, I tend to agree with these projections. Phillips does many things very well, but a step backward seems much more likely than a step forward. It would also seem unlikely that he'll repeat his 30/30 season, which was largely a function of his high number of ABs and his low number of walks. Phillips should be very solid in 2008, but a step backward shouldn't be unexpected. .289/.356/.438/.794 in 502 ABs with 16 HRs, 66 Runs, and 76 RBIs. Bill James: .287/.355/.476/.831 in 494 ABs with 19 HRs, 66 Runs, and 79 RBIs. ZIPS: .291/.361/.460/.821 in 506 ABs with 18 HRs, 70 Runs, and 78 RBIs. And, yet again, the countdown begins for Edwin's break out season. It seems every year people are predicting big things from Edwin and every year he doesn't provide them. So, once again, people are predicting big things from Edwin and maybe this is FINALLY the year. However, I've tempered my expectations, which are now more in line with the listed 2008 projections than any breakout performance. For me, the presumption has flipped on both Matt Belisle and Edwin Encarnacion. For each, I waited two or three years for them to put up the kind of numbers that were expected. However, at this point, I no longer expect the breakout year to arrive, but rather just another mediocre one. I'll no longer play Charlie Brown to the Lucy of Belisle and Edwin, so 2008 will not see me taking yet another big swing at the football. For now, I'll expect the worst and wait for them to prove me wrong. .272/.325/.468/.793 in 393 ABs with 16 HRs, 55 Runs, and 55 RBIs. Bill James: .254/.308/.416/.724 in 425 ABs with 13 HRs, 51 Runs, and 55 RBIs. ZIPS: .257/.317/.417/.734 in 432 ABs with 14 HRs, 57 Runs, and 58 RBIs. Alex Gonzalez was a big surprise in 2007, as he exceeded all realistic expectations and yet fans still weren't satisfied. A-Gon was stellar at the plate, posting his best career offensive season. In addition, his defense was quite solid, plagued only by a few more errors than usual. However, he displayed good range and turned the double play very well. 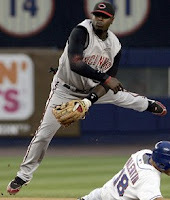 All in all, Reds fans should be very pleased if A-Gon replicates his 2007 season. However, he is likely to regress to the mean a bit, as his bat just isn't as good as it was in 2007. Given that Reds fans weren't satisfied by A-Gon's career year and that he's unlikely to match that production in 2008, expect the calls for Keppinger to be frequent. .332/.400/.477/.877 in 241 ABs with 5 HRs, 39 Runs, and 32 RBIs. Bill James: .321/.380/.430/.810 in 365 ABs with 5 HRs, 49 Runs, and 36 RBIs. ZIPS: .307/.360/.408/.768 in 449 ABs with 6 HRs, 60 Runs, and 48 RBIs. Keppinger was a true surprise in 2007. Last offseason, Krivsky made a series of moves that seemed very odd and illogical at the time, but ultimately netted the Reds Jeff Keppinger. Keppinger seems like he could just roll out of bed and hit .300. His bat control and ability to make consistent contact are truly first rate. In 2007, Keppinger had more walks (24) than strikeouts (12). In 241 ABs, Keppinger struck out only 12 times! His Contact % was 93%, which is better than Ichiro. While his lack of secondary skills does temper his value a bit (in fact, Keith Law argued that he was one of the most overrated players in baseball last year), he's a nice player for an all or nothing Reds offense. Batting average is driven largely by putting the ball in play, as a ball cannot find a hole if it is in the catcher's mitt. Strikeout kings like Adam Dunn and Richie Sexson aren't going to be able to post high batting averages. However, Keppinger is a player who will consistently put the ball in play and will have a high average as a result. He brings a new dimension to the Reds lineup which at times can be too one dimensional. It'll be interesting to see how the Reds get his bat into the lineup, as Baker doesn't have faith in Keppinger's ability to handle shortstop over the long run. Accordingly, he seems destined to be a utility player and spot starter. He hasn't been with the Reds long, but he's been there long enough to become a fan favorite. 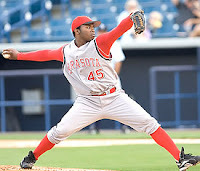 Well, for those who haven't seen him yet, here's a look at Johnny Cueto in action. Former Reds beat writer C. Trent Rosencrans has provided a video clip of Johnny mowing them down in spring training. Cueto is ready and he NEEDS to be in the rotation out of spring training. He's got electric stuff and tremendous command. If he breaks camp with the Reds, there's no doubt in my mind that he would be the Reds second best starting pitcher behind only the great Aaron Harang. Cueto has comparable stuff to Homer, but his command makes him much more effective. Johnny could be the pivotal man for the Reds and their chances for success in 2008. Well, sadly, it's time for Jay Bruce to return to the minors. His play has been inspired and his exuberance appreciated, but in the end the Reds still need to return him to the minors. As good as Bruce has been, he's still been outdone by Johnny Cueto. Unfortunately, there's only room for one of the two on the team right now and it has to be Johnny Cueto. Under the MLB rules, a team controls the rights to its players for the first six years of his career. The first three of which are years where the team can dictate the player's salary and the final three of which involves salary arbitration to determine player compensation. After six years, the cost control is gone and the free agent market awaits. If the Reds were to keep both Jay Bruce and Johnny Cueto on the MLB roster coming out of spring training, then it is very likely that Homer Bailey, Joey Votto, Jay Bruce, and Johnny Cueto all will be eligible for free agency after the 2013 season. In 2007, Homer and Joey played enough to earn, respectively, 0.041 and 0.027 years of service time. So, just like Cueto and Bruce, they would need to be at the MLB level for the next 6 full seasons to earn enough service time to hit free agency. While it's fantastic to have all this impact rookie talent in the mix, the Reds need to manage it in order to get maximum value. It would be foolish for the Reds to put their four top prospects on the same service time schedule, as it would reduce the opportunity to retain all or even the most of them. As it stands, it's unfortunate enough that the Reds will likely have three top prospects on the same schedule, but adding the top prospect in baseball to that mix would be foolhardy. By keeping Jay Bruce in the minors for a few months of 2008, the Reds would ensure he gets a bit more time to polish his game and delay the start of his service time clock. If they did so, they could bring him up mid-season and delay his impending free agency until after the 2014 season. The Reds have done a great job of drafting and developing talent, but they need to ensure that they get the most out of it. Given that the Reds aren't likely going to be able to send Votto and Bailey down long enough to delay their free agency date, it comes down to a choice between Bruce and Cueto. As good as Bruce has been, Cueto has been better. Cueto is the talk of the Grapefruit League and he needs to be in the Reds rotation when they break camp. Unfortunately, that means that they'd be better off putting Bruce in the minors to start the year. Trend Spotting....Is that an African or European Swallow? Two interesting and likely related trends are emerging in MLB these days, both of which are clearly byproducts of the MLB's exploding salary structure. MLB is flush with revenue these days, which is being passed on through to the players. The internet division of MLB is growing by leaps and bounds, which creates more financial resources for teams to plow back into their organizations. This phenomena not only drives up player salaries, but it also has two unintended effects. 1) Teams are unwilling to pay millions of dollars to league average starting pitchers. The trend only began to reveal itself in the latter portion of this offseason, as the market changed quickly, pulling the rug out from several veteran pitchers. 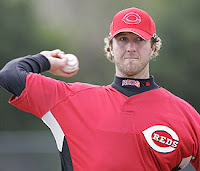 Josh Fogg terribly misread the market when he turned down an offer of $5M for 2008 from the Rockies and was forced to settle for a $1M contract from the Reds. As bad as it is for him, he still fared better than Jeff Weaver and Kyle Lohse, pitchers who are still out of work. The market has completely dried up, as teams are looking more and more towards inexpensive young talent to carry the load. Even the Axis of Evil tandem of the Red Sox (Clay Buchholz and Jon Lester) and the Yankees (Joba Chamberlain, Phil Hughes, and Ian Kennedy) are relying more on the cost efficiencies inherent in younger players. It's a trend not likely to change any time soon. As long as the cost for players with 0-3 years of service time remains astronomically low, rookies and prospects will see their value continue to skyrocket. A young player who provides equivalent production to an established veteran is SIGNIFICANTLY more valuable, as his production comes at a fraction of the cost. The young player's production is much more efficient and in the modern game, the most efficient organizations win in Major League Baseball. As long as the upper reaches of the pay scale continue to out pace the artificially constrained lower end, the value of prospects will rise and the value of expensive veterans will fall. 2) Players with less than 3 years of service time are not happy with their salaries. The younger players have become aware that they are getting the fuzzy end of the lollipop and they aren't happy about it. This offseason, players like Prince Fielder, Cole Hamels, and Nick Markakis have failed to get multiyear contracts from their organizations. Instead, they've seen their contracts renewed at bargain basement prices, as is the organization's right under the Collective Bargaining Agreement (CBA). Prince Fielder on having his contract renewed for $650,000: "I'm not happy about it at all," Fielder said. "The fact that they've renewed me two years in a row now. There are a lot of guys with the same amount of time I have who have done a lot less than me and are getting paid a lot more. But my time is going to come and it's coming quick, too." Cole Hamels, on having the Phillies renew his contract for $500,000: "It was a low blow." Nick Markakis after having his contract renewed for $450,000: "We couldn't come to an agreement with anything, so we're just going to take it and get renewed. That's just how the Orioles feel. I don't have much of a choice. I'm just going to have to deal with it." The escalation at the upper range of the salary structure is now putting pressure on the lower end of the pay scale. You can see the effect in the pay for the lower range veteran ballplayers, as not many have to settle for $1M anymore. However, the star players with only 0-3 years of service time cannot join in on the booming salaries, as their pay is restricted by the terms of the CBA. The rising tide of increased revenue is raising all salary boats in MLB, with the exception of the boat containing the young star players, which is chained down. It's obvious that players the caliber of Prince, Cole, and Nick don't like making significantly less than their peers, especially while they are in the process of drastically outperforming those peers. Given the dissatisfaction expressed by the stars with less than 3 years of service time, it seems likely that the MLB minimum salary will be revisited and revised in the next round of collective bargaining. The MLBPA will likely push for increased salaries at the lower end of the service time spectrum, which will bring the MLB universe back into balance. Perhaps the best way to get this done is for the MLBPA to agree to a restriction on what can be paid to draft choices, in exchange for MLB conceding to an increase in the salary range of players with 0-3 years of service time. The value of younger players has skyrocketed over the past several years, largely at the expense of league average veterans. Changing the financial structure of the game to increase the cost of the younger MLB players, while reducing the cost of unproven draft picks, could tip the scales back the other way towards the veteran players. If younger players cost more, then their production will be less efficient and they will become a bit less valuable, which will again drive up the value of veteran players. So, league average pitchers will be able to find jobs and prospects will once again be available in trade deadline deals. However, until that time, the value of a top notch farm system has never been higher, which means that the Reds player development efforts are peaking at the exact right moment. Yet another reason to be optimistic about the direction of the Redleg organization. Reds Outfox Everyone by Signing Juan Duran!!! Well, it was a banner day for the Reds renewed international scouting efforts, as the Reds reaped the rewards of having competent scouts and an owner willing to spend money on international free agents. 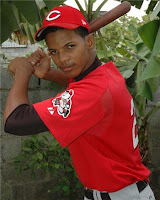 The Reds today signed 16-year old Juan Duran out of the Dominican Republic. While most organizations didn't think that Duran was eligible to be signed until July 2, the Reds uncovered that under the rules they could sign him now. Even Duran's agents were under the impression that he had to wait until the start of the international free agent signing period (July 2 to August 31), but the Reds were correct and as a result they have brought Duran into the organization. Duran is only 16 years old, but he already stands 6"6' tall and weighs 190 lbs. He bats right, throws right, and has almost unlimited power. Some scouts already have his power at 80 on the 20-80 scouting scale. Obviously he's young, but he seems to be an impact prospect at least equivalent to Drew Stubbs and Devin Mesoraco. So, once the big four prospects graduate from the Reds system, Duran may help form the next wave of top tier talent. In fact, he could conceivably be our #1 prospect in the near future. Given his age, he's clearly got a lot of developing to do, but the Giants signed Angel Villalona as a 16-year old out of the Dominican Republic and Baseball America just rated the now 17-year old as the team's #1 prospect. 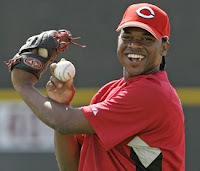 Unfortunately, the Reds forfeited their 2nd round pick in the 2008 draft because they signed Francisco Cordero. It would have been their 1st round pick, but since they select in the first 15 picks, that draft pick is protected. However, this signing helps offset the lack of a second round pick. 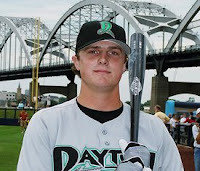 In fact, given Duran's skill-set, the Reds essentially added another 1st round pick to the farm system. This is exactly how the Reds need to operate in order to be competitive at the Major League Level. It's important to draft well, but it is also vital to supplement that talent with international prospects. If you can acquire two impact prospects in the draft and two via international free agency each year, then the farm system will always be in good shape. It's not enough to just draft well any more, as the best farm systems have a blend of prospects acquired from the draft and those signed internationally. All in all, it's hard not to feel great about the Reds organization on a day like this. It's just another example of the Reds renewed emphasis on player development, which should help make the Reds a successful MLB team for a sustained period of time. The Reds topped the Pirates 12-11 on Saturday, illustrating that as to be expected, the hitters are ahead of the pitchers. Anyway, here are some early thoughts on the Reds spring training happenings. 1) The Alex Gonzalez injury means that the Reds are likely to need another shortstop to start early in the season. One would think that Jeff Keppinger would be the easy, logical choice. However, today's starting shortstop brings a shudder down the spine. Instead of anointing Keppinger the starter and letting him play at short, Dusty instead gave Juan Castro the start and Adam Rosales the mop up duty. It seems very odd that Keppinger only played first base, especially since Adam Rosales is very unlikely to be a shortstop at the MLB level. 2) Jay Bruce continues to what he has always done. Crush the baseball. The level of competition doesn't seem to matter, as Jay Bruce can rip them all. He could roll out of bed in the dead of winter and hit. And, Reds fans, he's ours for years to come. 3) Ken Griffey Jr. and Adam Dunn each hit their first homerun of the spring off of Zach Duke. Duke set the world on fire in his rookie year, but now serves as little more than an important example of pitchers needing to strikeout more than 5.0 per nine innings to be effective. At this point, his low strikeout rates seem likely to doom his career. 4) Josh Roenicke could steal a spot in the bullpen with a stellar spring. My gut tells me that he needs more polish, but performances like today could push him to the MLB level. He pitched one inning, allowing no base runners and striking out 2. 5) The infamous "Trade" between the Reds and the Nats has done nothing but ruin the careers of just about everyone involved. 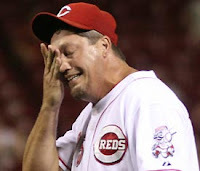 Kearns and Lopez have been disappointments in Washington and Billy Bray and Gary Majewski have been disasters for the Reds. Bray can't get healthy and Majewski has been a gas can in Cincy organization. I have high hopes for Bray, but he needs to get healthy in a hurry. At this point, Majewski with his 40.50 spring training ERA is on the verge of becoming irrelevant. 6) It is nice to see Rosales moving back up the defensive spectrum, as that can only increase his value. His bat isn't going to be enough to handle firstbase, but if he can play a more challenging defensive position, then his prospect value increases. 7) While Norris Hopper is the clear option in centerfield if Jay Bruce heads back to the minors, it is good to see the Reds giving Chris Dickerson a look. He is one of the best athletes in the system, but a lack of consistent contact has plagued his development. However, he can certainly be of use if he can increase his contact rate. Interesting news out of Reds camp yesterday. Alex Gonzalez had been sitting out early this spring training with a bruised knee, but additional tests have now determined that he is actually suffering from a compression fracture of the left knee. What's truly strange about it is that Alex Gonzalez didn't start a single game after September 12th last year because of a bone bruise in the same knee. Now, I haven't heard any definitive word, but I think there is a good chance that he wasn't suffering from a bone bruise at the end of last year, but rather the more serious injury that was recently diagnosed. It may well be time for the Reds to get serious about the medical care that is provided throughout the system. In the modern game, teams like the A's, Red Sox, and Padres have taken to maximizing the efficiency in all their baseball operations. They look at every aspect of their operations and determine the best way to maximize the effectiveness of that department. Their efforts have extended to injuries, which can really reduce the efficiency of production obtained per dollar spent. If you can reduce injuries, then you'll get more for your money, which is key to the success of every organization. The A's have had good success using what they call a "pre-hab" program, which was implemented under former pitching coach Rick Petersen. It involves a workout and throwing regimen that is specifically designed to target the muscles used in the pitching motion, which helps reduce injuries to a pitcher's arm. This detailed and effective program is seemingly in direct contrast to how the Reds operate. I remember an incident a few years ago that I still haven't heard explained. Aaron Boone was dealing with a "sprained knee" and missed some time, but eventually made his way back onto the field. He lasted about three innings before his knee buckled and he had to leave the game. After the game, it was revealed that Boone had a torn ACL in his knee. Given the limited amount of time that he was on the field, it seems likely that he was dealing with a torn ACL the entire time and that it was misdiagnosed by the Reds medical staff. If that is truly the case, then it is difficult to understand how they could have overlooked such a commonplace sports injury. When you add in the struggles the Reds have had with injuries to their pitching prospects (Ty Howington, Chris Gruler, Richie Gardner, etc), Ken Griffey Jr.'s injury struggles, and the possible incorrect diagnosis of Alex Gonzalez's knee injury and it becomes difficult not to question the manner in which the Reds run their training and medical staff. Given the amount of money being invested in baseball players, the value of keeping them healthy continues to skyrocket. A $10M player isn't worth much if he can't stay on the field, so it may be time for the Reds to re-evaulate and possible overhaul the way they prevent, diagnose, and treat injuries. As a mid-market team, it's important to get the most production per dollar spent and if the Reds aren't keeping their players on the field, then they aren't getting enough value per dollar to be competitive. I'm not a medical professional, but it hardly seems like the Reds are doing enough to keep their players healthy and productive.